Chandra was just mesmerised. He could not take his eyes off her. She was singing, just as it was sung originally by Ruby Murray. Her melodious captivating voice almost made him lost. He stood like a Greek statue, and took him sometime to get over the trance he was deeply gone into. All these days he had been admiring her beauty, and then her qualities and demeanour. But never knew she was gifted with such a beautiful voice. Chandra fetched her to his Castle Street home with the intention of introducing her to his family. His elder brother and family landed back home from England after sometime. To celebrate their arrival the family had arranged a get together. So Chandra thought it would be the ideal occasion for him to introduce Theera to his people. 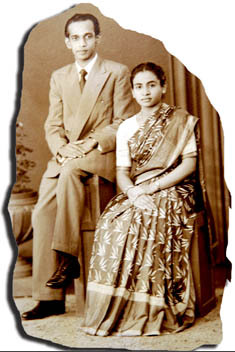 "When Chandra wrote to my parents in Jaffna declaring his love for me, my father was neutral, but not my mother. She got really upset and would almost imprison me at home when I went there on a holiday. However I escaped after convincing her with all sorts of excuses and came back to Colombo," says Theera. However Theera's mother hurried up looking for a suitable partner for her eldest daughter from their own Tamil Hindu community. She thought since Theera was entangled in love with a man in the medical stream (and also she too was in the same stream) it would be better to find someone of a similar profession. But to her marvel, the matchmaker brought a proposal of a dentist, of the same profession of Theera's lover. She proudly informed her 'Mootha Mahal' (eldest daughter) about the new suitor she found for her. Theera got nervous. So, Chandra decided to meet his 'competitor'. "Are you really interested in getting married to her" asked Chandra. "Well, it was my uncle in Jaffna who arranged this proposal for me. Still I haven't seen the girl. I am happy you came to meet me and expressed your feelings boldly. If you two are that much interested in each other why not go ahead and get yourselves registered?" suggested the 'Tamil suitor'. The 'Sinhala suitor' was startled as it was something that he never expected. "What a great idea!" he tried to collect his thoughts. That evening at the coffee shop benevolent Chandra had a long story to tell Theera. In between he was cheerfully adding the dreams he had been having of their future. But Theera was not that amused. There was something pricking her mind. "Are you sure that he would not inform my mother that we might end up getting married secretly" she asked. "Oh, come on Theera. He sounds good," said Chandra. "But I have a feeling that though he has suggested that and pretended he is supporting us, later he would pass the message to my people once he goes back to Jaffna." After two days Dr. Nelson, Second-in-Command of the Dental Institute of Colombo along with his wife were seen driving up the St. Sebestian Hill and stepping into the Registrar General's Office, Colombo. Chandra and Theera were getting married under a special licence. Mr. and Mrs. Nelson were the witnesses at their marriage. "We had a marriage and not a wedding," repeats Chandra after 50 years. After the registration, and having a delicious meal with the Nelsons the couple went back to their boarding places as if nothing had happened. Theera was recalling how she prayed the whole of the previous night. "Please, let me be able to get the best answer by morning," she pleaded. "I was going against my people though Chandra's family was quite positive. I didn't tell anybody. I didn't know to whom I prayed, as I did not want to put anybody in trouble over my decision," she laughs. Theera's suspicion was right. On the following day, her mother almost flew from Jaffna to Colombo in the 'Yaaldevi' train. But she was too late, her 'Mootha Mahal' was no more a 'Miss. Arumugam', but 'Mrs. Fernando'. However after all, it was an unbearable situation to a mother who had many dreams and hopes upto the sky of the most beautiful day of her daughter's 'Kalyanam' (wedding). She sobbed and sobbed. And then tried almost to abduct Theera back to Jaffna in rage. Theera who had just returned from office to her boarding place was really sorry for her mother. But! she loved Chandra. Nothing could separate her from him. Eliyapurage Alwis Chandra Tissa Fernando was born on Valentine's Day - February 14 in 1925. His father, E.A.Fernando was a resident from Hambantota who became a successful plumbago merchant. His mother was Kanda Uda Dewage Euvisinia Fernando. Chandra was the fifth out of 11 siblings in his family. He was studying at Royal College when the Second World War broke. "We were living in Castle Street, Borella. When the Japanese bombed Ceylon, one of the bombs fell into the General Cemetery (Kanatta). Almost all the residents in our (Borella) area started moving inland, so my parents also decided to do so. We moved to a rented place at Awissawella," recalls Chandra. For Nearly about two years, Chandra's family was at Awissawella. The whole set of children of Alwis Fernando's family who were born and bread in the city, were enjoying the village life thoroughly. Chandra's father lost his Plumbago business due to the War, changed his trade to jewellery. he was the owner of E. A. Fernando Jewellers at No.49, Chatham Street, Colombo. Chandra was admitted to Ananda College, Maradana where he excelled in the science stream and entered as one of the seven students of the batch in to the Department of Dentistry at the University of Ceylon, Colombo which then shifted to the University of Peradeniya. 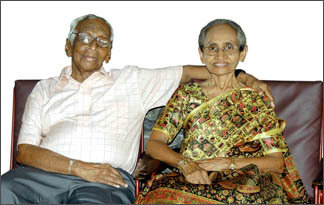 Theera Arumugam was born on February 10 in 1932 to a teacher couple Sinnathambi Arumugam and Thangaratnam Thambiah. "I have one younger sister. I was born in Singapore as my parents were teaching there. I had my education first at Fairfield Girls School, Singapore, and then at Urumpirai Hindu College, Jaffna. Urumpirai was my village which was situated between Palali and Jaffna town," she says. Theera did her Higher School Certificate (HSC) at St. John's College, Jaffna. "Those days the trend in Jaffna was to send the girls to India for higher studies. But, my mother was reluctant to send me off. But after my London Matriculation I just applied for a government scholarship in UK for physiotherapy, and got it. Uncle Sivaratnam who was a government accountant was my mother's cousin. He was staying at Edmonton Road, Kirullapone. Whenever we came to Ceylon from Singapore or vice versa we used to land at his place before we went to Jaffna. He was a progressive man who encouraged both boys and girls to have higher education. He somehow convinced my parents and got me the opportunity to go to London. Also, later when I was working I was staying in his place. When my mother was playing hell over my marriage it was he who calmed things down and settled everything. He had been on my side," she reminisces. The four year period (1952-1956) of her stay in England at the School of Physiotherapy - St. Thomas Hospital was extremely enjoyable and memorable period. "I never saw a string of colour bar among anybody there. Even whenever we stepped into a shop, the shop keeper would say, 'Oh! hello, are you from Sri Lanka? I have visited there once. Nice country and hospitable people.' Sri Lanka was under the British reign. During the time of the Second World War. Due to these two reasons many Britishers had visited Ceylon," she says. Theera still corresponds with her British batch mate Isobel Adamson Hulbert. "Both she and I are grand mothers now," laughs Theera. Theera and Chandra met each other at the Department of Physical Science when Chandra started getting ultra-violet ray treatment from one of Theera's colleagues for his 'white patch' (Leucoderma) on his lip. "He knew my boss, Dr. Frank Perera, Physician-in-charge of the Department of Physical Science. I had studied in mixed schools, and was quite free with boys. So I used to talk with him as I did with other colleagues. But admired his decent and truthful personality," she smiles. "She was pretty, active and friendly with a beautiful voice. When I first proposed to her she at once said, 'It sounds that you have not associated with girls that much'.... So that proved my decency as well, heh! heh! heh!," laughs Chandra. "When he proposed I at once said it would not happen as we belonged to two different racial groups. I could still remember what he said then. 'Theera, if you can't marry me, then be sure that you will find a partner who will take good care of you and look after you well. That's all what I want'... And I felt his deep love towards me," she smiles. After a few months of their registration, Chandra and Theera entered into their own nest on rent. In 1964, they built their present place at Castle Street, Borella in a plot of land which Chandra's father divided for him. "My father could give a plot of land in Colombo for all his 11 children. Now can you imagine of giving such a thing even to a single child of yours. Everything has gone up like Sky Rockets," points out Chandra. 'Alwis Avenue' (adjoining the Castle Hospital) where Chandra's family has been living was named after his father as he was one of the first residents in the area. "My father owned the fifth French 'Caltroup' car brought to Ceylon during the British reign," recalls Chandra. Dr. Chandra was in the government service from 1956 to 1967, retired and started his own private practice at his residence. All together he had worked as a Dentist for 50 years. "I decided to enjoy the full retirement since last year," he smiles. Theera retired in 1987, and has been engaged in many voluntary work. "I worked as a voluntary Physiotherapist for Family Rehabilitation Centre. I followed the course for Physiotherapy for torture survivors in Denmark and conducted mobile clinics throughout Sri Lanka for many years. Apart from that I have followed many course in Physiotherapy in many countries including a teachers' training course in England, Bangladesh and Barcelona," she recalls. "Ethnic problems and terrorism have never bothered and disturbed our family life, nor our only daughter Sudeera who is now living in Canada with her husband and two teenage children. I think the terrorists and communal minded persons should have used their 'human' energy not to destroy this country, but to build it up," suggests Theera. "Why can't us, the Sri Lankans live as one Nation," asks Chandra. "My father was dead by the time I met Theera. Only one brother of his was a little against our marriage. Later he apologised to Theera for that," says Chandra. "His mother, sisters and rest of the family have been a blessing to us throughout. My mother took sometime to settle her mind. But my father gave his full blessing saying 'show the world that inter-racial marriages are a success," reminisces Theera. "However we looked after both Chandra's and my mother who died leaving their love and blessings to us in their later stage," concludes Theera. Produced by Lake House Copyright � 2007 The Associated Newspapers of Ceylon Ltd.